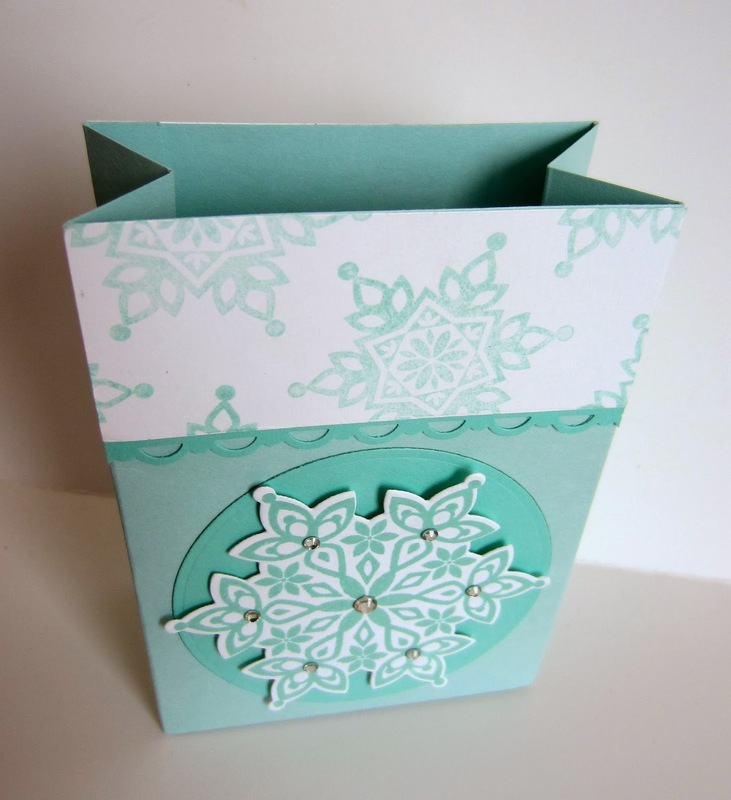 At my November Stamp-In, the girls created this cute gift box/bag. I'm not really sure whether I should call it a box or a bag, so it's a gift box/bag. Measuring a cute 3 1/2" x 5", it can be filled with basket filler (crinkled paper), tissue paper, or a treat can be placed inside a cello bag. I couldn't decide if it needed a handle or not. Sporting a handle of some sort would probably put it more in the gift bag classification. Paper or ribbon handles? I debated forever, and finally decided I liked it best this way. My bag/box. A firm base measuring about 1 7/8" x 3 1/2", allows it to stand without being tipsy at all. With a bit of imagination and Stampin' Up! 's Simply Scored, you can create these little cuties in almost any size. 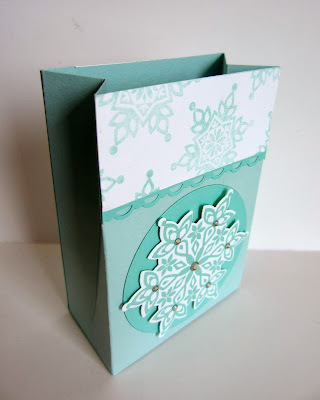 Featuring the Festive Flurry stamp set and its coordinating Framelits gives it a wintery feel. Not just for Christmas. WOW!!! You did an amazing job! Your experience really shows! I posted this on my "Paper Craft" Pinterest Board! It's so pretty! Wish I could have been there. Could you send me the instruction sheet to make one? This is lovely. Thanks for sharing at Thursday Favorite Things Hop. What a lovely idea! This are beautiful and creative. thanks for sharing. Visiting from Creative Home & Garden Blog Hop. This is so beautiful! I wouldn't even care what was in it because the bag is so gorgeous, lol! 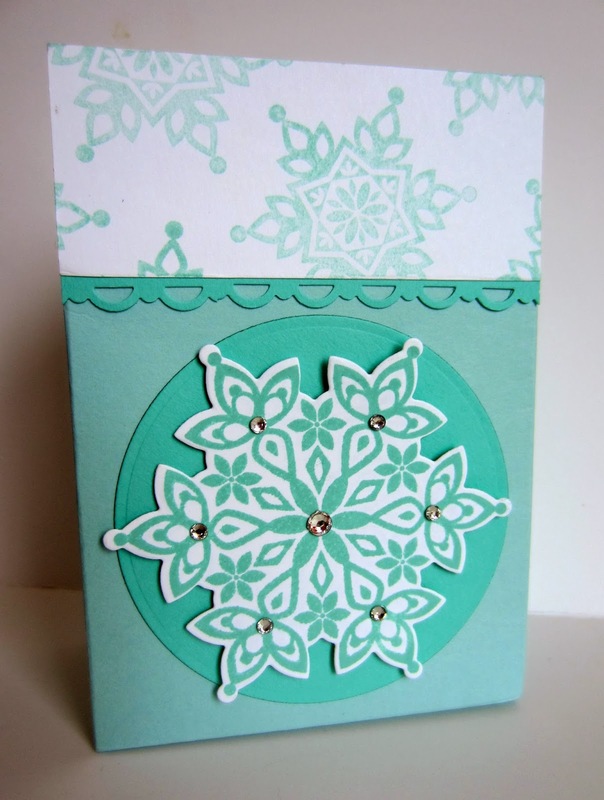 Thanks so much for sharing at Get Your DIY On! I hope to see you back on Sunday at 7 pm EST to link up any of your favorite projects! Have a wonderful weekend! I love your gift bag/box! :) so cute. I love this card so much!!!! SO inspiring! Thanks so much for sharing!! !